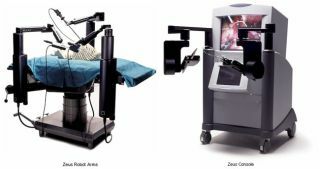 The Zeus system has two parts, the surgical device (left) that is controlled by a surgeon sitting at a remote console (right). It gives new meaning to the term "housecall", but aquanauts aboard NASA's undersea research station, Aquarius, have performed simulated medical procedures with the help of a Canadian doctor 1300 miles away. The 11-day mission, which ends October 21, is a trial run for telemedicine techniques that could be used in emergencies on the International Space Station or on future missions to the Moon or Mars. All the simulated operations were done in the Aquarius Undersea Research Station, which is located 67 feet below the ocean surface, off the coast of Key Largo, Florida. "We have learned that it is possible, and quite safe, to telementor an untrained person through a complex medical task," said Dr. Mehran Anvari, one of the principal investigators from the McMaster University Centre for Minimal Access Surgery. Dr. Anvari remotely guided the NASA Extreme Environment Mission Operations (NEEMO) 7 crew through gall bladder surgery and the suturing of arteries from the university's hometown of Hamilton, Ontario. "They were my hands and eyes," Dr. Anvari said. "And they performed beautifully." The six-members of NEEMO 7 included three physicians, none of whom are surgeons. Crew Commander Bob Thirsk, a family practitioner, said that the surgery techniques were "very new for us." This unfamiliarity was key to one of the main questions of the mission: "can a minimally trained astronaut perform complex medical procedures with the help of telementoring or telerobotics," Thirsk said. Of those not medically trained, Lt. Colonel Catherine "Cady" Coleman, a NASA astronaut and polymer scientist, made a point of not studying any medicine before the mission. "I'm sort of the least trained person here," Coleman said. But she seemed proud to add that: "I took out a gall bladder yesterday." The "patient" that the crewmembers operated on is a specially designed rubber body cavity. "It looks like a Thanksgiving turkey before you cook it," Coleman said. "We can't see what's inside." One of the more complicated procedures performed on this mock patient was gall bladder surgery. This could be a real medical emergency on a spacecraft, Dr. Anvari said, because gall bladders are not taken out of astronauts before they go on missions. The removal of the simulated gall bladder was done laparoscopically -- meaning four or five small holes were made in the abdomen to allow the insertion of a small video camera and medical instruments. Coleman, who flew twice on the Space Shuttle, said that maneuvering grabbers and staplers inside the rubber cavity was similar to operating the shuttle's robotic arm. But it was still daunting. "Fortunately, we had people mentoring that made it a lot easier," Coleman said. There was also a robot on board, the Zeus system, that aided in the surgery. Through the robot's arm, Dr. Anvari controlled the internal video camera. During this trial, the NEEMO 7 researchers realized that the robot had some limitations. First of all, it was too large - taking up nine square feet on the ground - for the compact areas of Aquarius, or a spacecraft, for that matter. The robot also had only one arm, which Dr. Anvari said was sufficient, but he typically has three robotic arms at his disposal when he performs telerobotic surgeries. Dr. Anvari has operated remotely on 22 patients in parts of Canada where few surgeons reside. Besides gall bladder removal, the NEEMO 7 crew also sutured arteries together, which could be a vital operation if there was an accident on a space-faring mission. Thirsk did not think that the suturing went as well as other procedures. He felt that perhaps some training on the ground might make this go smoother. "My perception is that some special skills may be necessary [for the astronauts]," he said. Dr. Anvari thought that having astronauts practice medical operations once before heading into space would be helpful. Still, Coleman was confident that with the advances in video technology, astronauts can be led through all kinds of complicated tasks. She said that NASA rarely sends up manuals in spacecrafts anymore. "Why describe in words when you can send video," Coleman said. Under the tutelage of telementoring, she and her crewmates also performed ultrasound imaging of one of the living crewmembers, Billy Cooksey. And in the final days of the mission, there are plans for removing a kidney stone from the ureter of the simulated patient. "Astronauts are very prone to kidney stones, because in zero gravity, there is more bone re-absorption," Dr. Anvari explained. However, being only 13 feet wide (4 meters) and 45 feet long (13.7 meters), the facility is fairly cramped for six crewmembers. Coleman said that similarities between Aquarius and space travel are many, but one glaring difference is what's outside the window. "There's certainly more life out here," she said, speaking of the large schools, nearby coral reefs, and a four-foot long fish that she considers the "guardian" of the habitat around the station. Despite these "distractions," Aquarius has been a training ground for future astronauts. Mike Fincke, who is currently on the International Space Station, was an aquanaut for NEEMO 2. "He was absolutely better prepared for his time on the space station after being in Aquarius," Coleman said. She thought the current NEEMO mission was addressing the logistics of communication and the limitations of physical space in dealing with medical emergencies. "This kind of experiment can make these challenges clear," Coleman said. Thirsk, who has also flown in the Space Shuttle, also found Aquarius to be similar to space flight. But he was aware that telementors would have to deal with long time delays in communications when astronauts are far from Earth. To combat that, he said, "there would need to be more on board artificial intelligence." So not only will medical robots need to become smaller and grow more arms, they also "would need to be more independent," Thirsk said.